Competition Details: Freeride Competition Judging Criteria: Style, Maneuver Difficulty, Slide Variations, Overall Flow of Run Slide Competition Judging Criteria: Slide Variations, Speed, & of course Speed Only July 27th we will announce the event location on Gravityboard.com, Muirskate.com, & Silverfishlongboarding.com This event is for everyone!! 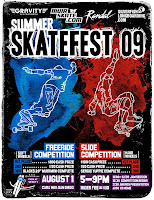 All levels of skating welcome in both events. In other words, we want everyone to come out and enjoy the day with us.